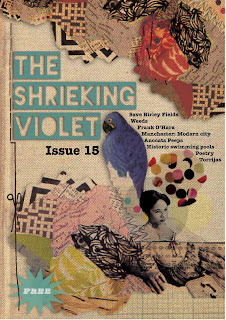 Issue 15 of the Shrieking Violet is out now, roughly coinciding with the fanzine's second birthday (which would have been August 1 if real life hadn't got in the way!). It features a passionate defence of urban green space Birley Fields (under threat from MMU's new 'super campus') by 'lefty, greeny veggie', Keith Reynolds, who writes the blog Valiant Veggie about creating a mini-wildlife habitat on a balcony in inner-city Hulme, as recently featured in the Manchester Evening News. Keith is "passionate about his work (in mental health), community development, nature and green issues and making stumbling efforts to be "the change he'd like to see in the world". 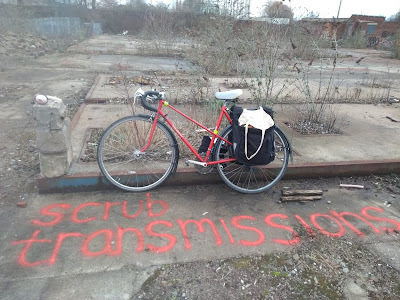 Brian Rosa, an artist, curator, urban researcher and PhD candidate in human geography at The University of Manchester, writes about Manchester as the 'original modern' city. John Mather is a Civil Engineer by profession. His passion for swimming has led him to compete in Windermere's 'Great North Swim' and also swim between Scotland's Western Isles. He once ventured into Siberia's (very cold) Lake Baikal. John has returned closer to home to contribute a page about Levenshulme Baths from an illustrated guide he is compiling to Greater Manchester's swimming pools. I have written a mini-guide to the summer wildflowers which can be commonly found in Manchester, inspired by the nature writer Richard Mabey whose most recent book is entitled Weeds: A Cultural History (listen to Mabey in the Wild, his recent Radio 4 mini-series on wildflowers here). I have also included my interview with Ancoats Peeps artist Dan Dubowitz. The Shrieking Violet is all about taking inspiration from the everyday, and Sam Lewis from London-based band Being There, who have just recorded their debut album, asks whether the American beat poet Frank O'Hara was saying something or nothing. Alex Boswell has drawn a picture of Frank O'Hara. Bury artist and poet Josef Minta has contributed some poems accompanied by an illustration. He has just published his first collection of poems and images for the Kindle, called The Abbreviated Day. Manu Pérez, who is originally from Seville but lives and works in Manchester, has written a recipe for traditional Spanish Easter dish torrijas (this fanzine has been a long while in the making!). The cover is by Manchester-based graphic designer Alyson Exall. Free paper copies have been left in various locations around the city centre such as Good Grief! shop, Oklahoma, Koffee Pot, Common, An Outlet, Manchester Craft Centre, Nexus Art Cafe and Piccadilly Records. The fanzine can be downloaded and printed here. Issues 1-14 can also be downloaded here. To request a free copy in the post email Natalie.Rose.Bradbury@googlemail.com. Email this address also if you would like to contribute to future editions or are interested in helping out with making the design more interesting and exciting, or join the facebook group here. The Manchester's Modernist Heroines walk (a collaborative project with Manchester Modernist Society and the Loiterers Resistance Movement) will be repeated on Saturday September 3 during the DIY Feminist Festival. Meet at 2pm in Platt Fields Park. For more information see www.nowhere-fest.blogspot.com.